Doo Town is a small but very distinct part of the township of Eaglehawk Neck. It comprises just thirty to forty shacks* or houses, nestled between the sand dunes fronting Pirates Bay (Descent Beach), a privately owned deer and cattle farm and the Tasman National Park. There is literally no room for Doo Town to grow. To find it, turn right off the Arthur Highway onto Blowhole Road (C338) after you cross the Neck, then drive about two kilometres. If you reach the Blowhole and the jetty you have passed through Doo Town. 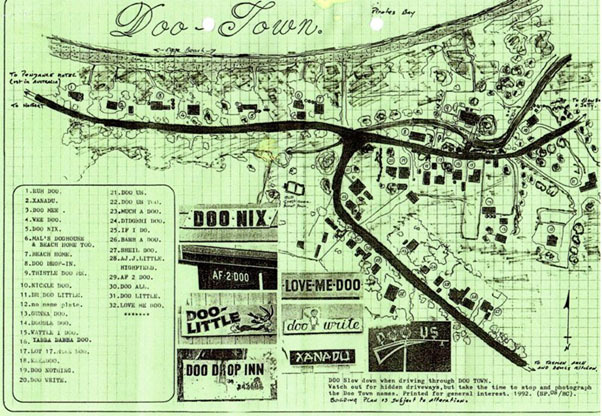 Over several years nearly every property owner in the area gave their shack* a ‘Doo’ name and eventually the Tasmanian Nomenclature Board approved Doo Town as the official name of the ‘town’. Doo Town has no facilities within its boundaries; however the local convenience store, café and take-away called ‘Havnabite’ is just a few minutes walk away and the famous ‘Doolishus’ food van (fresh, locally-caught fish and chips and ice-creams their specialty) is located at the nearby Blowhole car park every day from early September to the end of April each year. The town has a long, sandy beach that is safe for toddlers most of the time and is close to the local jetty and boat ramps that serve several tourist operators and recreational fishermen. The area is so popular as a base for all manner of fishing that, despite major improvements including a new jetty and additional trailer bays having been constructed in recent years, the lines of parked trailers can extend right through Doo Town over busy weekends. The map below is a copy of one prepared by Steve Pryde, owner at the time of “Thistle Doo Me” in 1992. Little has changed in Doo Town since then. *Shack – a uniquely Tasmanian name given to holiday homes (or weekenders as they are sometimes called). In times past shacks were built as temporary, or at most, modest structures – with or without council approval. Neglect and the passage of time saw many become run down and unsightly. Now, with the sea-changers moving in, shacks can range from the original format through to modern, substantial, architect designed homes.